In the build-up to the mid-semester vacation, Secondary School students at Regents International School Pattaya remained focused on the International Baccalaureate Diploma with two events: one aimed at those already on the Diploma course, the other on those who hoped to join it in the future. 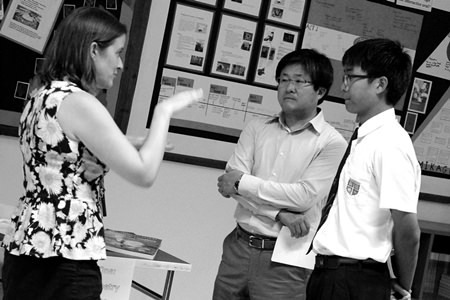 For those planning to join the IB Diploma course in August 2014 or 2015, the week offered the school’s annual IB Diploma Options Evening. This gave students and their parents a chance to learn more about the structure of the Diploma course from the Assistant Head of Secondary, Simon Miller and discuss with individual Heads of Department the more than twenty subject options on offer at Regents. 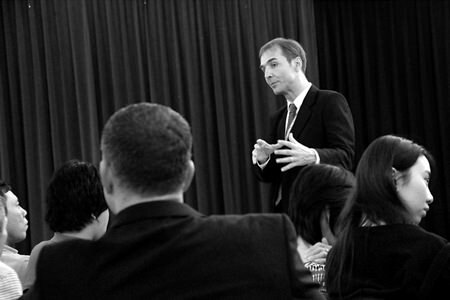 Assistant Head of Secondary Simon Miller answers students and parents’ IB questions at Regents’ IB Options Evening. For students already in Year 12 and studying Theatre as one of their six IB Diploma options, the focus of the week was on performance, as they performed pieces in the style of Bertolt Brecht, a German playwright who uses various non-naturalistic techniques to distance the audience from ‘feeling’ for the characters so that they focus on the real message of the play instead. Some of these students are newcomers to performing and they have really taken to the challenge and have been rehearsing for many hours outside lessons to achieve their goal. Head of English Tamara McKenna was on hand to offer advice to eager students and their parents. Regents students’ impress peers with their IB Theatre performance.